This Western Colorado KOA is centrally located between the panoramic views of the red rock structures on the Colorado National Monument and the national forest of world's largest flat top mountain the Grand Mesa. Experience Colorado's best hiking, rafting, and mountain biking in two diverse terrains. This unique valley embodies the American West making it the perfect place for outdoor enthusiast and scenic exploration. 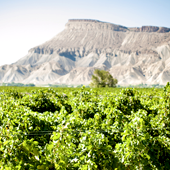 The town of Grand Junction offers something for everyone including our award-winning wine country. Home to the best wineries and wine tasting events in the state. Grand Junction also provides festivals, events, farmer's markets, shopping, local and chain restaurants, movies, and much more. Our family-owned and operated campground is equipped with family fun activities including a swimming pool, outdoor movie theater, playground, mini-golf, game room, and our infamous pedal bikes. 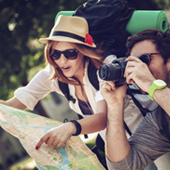 We provide options in both deluxe and regular RV sites, cabins, and tent sites. All sites come with free WIFI and cable.